Saturday, June 25, Bonnie, Rebecca and I left Winona, MS early, en route to Cleveland, TN. Our course had us in four states throughout the day: Mississippi, Alabama, Georgia and Tennessee. We arrived in the afternoon at the home of brother Robert and sister Barbara Wright; they graciously agreed to lodge and feed the three of us. We continue to be humbled by the extension of hospitality to us as we travel weekly; we are indebted to good brethren who take care of us and with whom we develop close relationships. Though appreciated when congregations provide motel lodging as visit them, it is more difficult to grow close to brethren when our time together is largely limited to Bible class and worship. Sunday morning, we were with the Central Church of Christ in Cleveland, TN. For Bible class, I presented Motivated by the Cross to 4th grade through adults. During worship, I presented Bible Archaeology. Several members expressed appreciation for both presentations, and many of the members took advantage of the good World Evangelism books we had for sale. We three travelers had multiple opportunities to enjoy the company of good brethren and share meals together. I feel that we make new friends and enhance former friendships, as we did this trip, nearly every time we fulfill appointments to apprise brethren about our mission work or to present other biblical lessons. 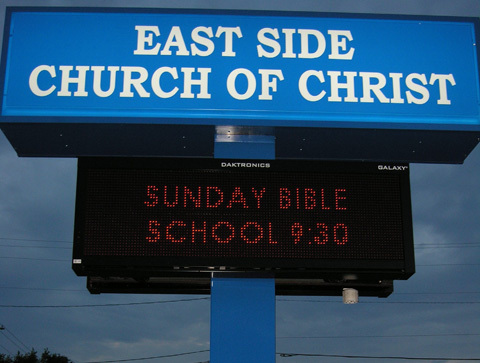 Sunday evening, Bonnie, Rebecca and I worshipped with the East Side Church of Christ; this congregation has been a longtime participant with J.C. and Betty Choate in their mission work. With the illness first and later passing of brother Choate, Jerry Bates and I, accompanied by our spouses, visit such congregations, in addition to churches to whom we report for ourselves. After worship, I reported to and showed Motivated by the Cross to the mission committee. Afterward, we three were the guests of Rick and Fay Hinson in their home; he is the go to person for missions at the East Side Church of Christ. Once more, we were treated to precious hospitality; we made new friends. As a sidebar, Rick’s hobby is making high quality, unique ballpoint pens by turning hardwoods and soft metals, combined with things such as rifle shell casings or animal antlers. Monday was another travel day. Since Rebecca had a narrow window of opportunity to visit her brother Raymond in North Carolina; she and we are going to make a mission trip to Guyana, South America in July, and then she returns back to teaching school in late July (at first, preparatory days before children return). She has to go in for at least a day before the mission trip have her classroom moved from one building to another. During the summer break from school, Rebecca also participates in one or more VBS programs. 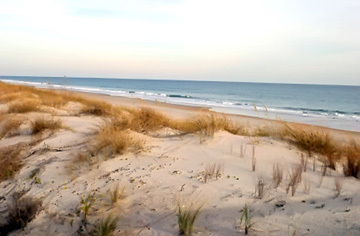 We traveled from Tennessee through North Carolina, Georgia and South Carolina to get to North Topsail Beach, NC where Raymond lives while stationed with the Coast Guard in the vicinity. Four states and ten and a half hours later, fatigued, we three arrived. Almost there (within two hours), we encountered severe cloud to ground lightning, heavy rains and pushy wind. We slowed down, but kept going and finally drove out of it. What Does the Bible Say about Alcoholic Consumption? Wednesday, June 22, Bonnie and I plus Rebecca headed to Jonesboro, AR. That evening I spoke to the Nettleton Church of Christ about Beverage Alcohol with my PowerPoint concerning the same subject; in addition, we made sure that each family had a copy of my book Beverage Alcohol available to it. Besides members, copies were left for a weekly substance abuse class taught at the meetinghouse. Through the generosity of brethren in Texas, we have been able to give away over 17,000 copies of the Beverage Alcohol book. I am available to present lessons on Beverage Alcohol to congregations of the Lord’s church, and I have made numerous presentations in several states. Whether I come or not, a limited number of Beverage Alcohol books are available free for distribution, though we do request the shipping expenses if possible. The Nettleton Church of Christ subscribes to and receives several cases of The Voice of Truth International magazine each quarter when it is published. I am one of the Editors of the journal, and Bonnie does the bulk of assembling the files into digital format. All of us at the Winona, MS office, of course, take our turn at trying to eradicate spelling errors and the most serious grammar infractions. 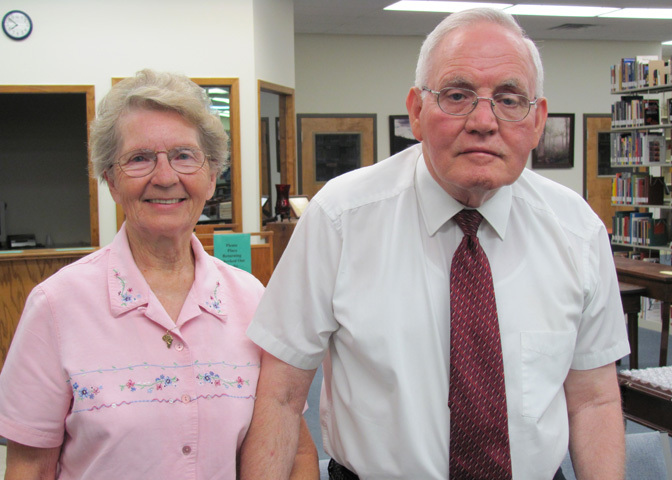 Byron Nichols, the Editor, selects most of the articles that he desires to appear in each issue; his wife Gaye comprises his “office staff” in Springfield, MO where they reside. Instead of traveling all the way back to Winona, MS from Jonesboro, AR after evening services, we lodged for the night at Rebecca’s Collierville, TN home. This was at least the second time that Rebecca came two hours south to our home in Winona, MS, only to pack a bag to layover in her own home as she accompanied us on one of our regional trips to visit churches of Christ. The first time, she found that awkward, but now she simply goes with the flow, so to speak. On the way back to Winona, we did some necessary shopping, and we got the oil changed on the car. Most of our shopping occurs en route to some appointment or returning from some appointment. Once an elder was dumbstruck that on our way that very afternoon to an appointment where he was an elder we had the oil changed in the car and had the tires rotated. Bonnie’s ringtone is “On the Road Again,” which often aptly describes our days. When one’s life is frequently, “On the Road Again,” shopping, oil changes and tire rotation occurs along the route of travel! Comments: Comments Off on What Does the Bible Say about Alcoholic Consumption? Saturday, June 18, Bonnie and I devoted ourselves to more yard and home maintenance, despite the hot, hot, sweaty day. Bright and early, a workman arrived (after literally months of trying to get another fellow or him to actually show up to do the work) to install an outside water spigot; for nearly four years, we have run a water hose around the exterior of the house. That was especially a nuisance since the hose obstructed the opening and closing of a door on a shed affixed to the house. Heavy winds a few days earlier littered our yard with tree debris. The pine trees are extremely messy, and they liter our yard with pine cones, branches and needles every time we have a storm of any degree. However, the severe winds, topping 70 mph, caused other trees to freely drop limbs and leaves everywhere; of course, the heavy winds caused the pine trees to give us more of their refuse than normal, too. We swept the yard with a riding lawnmower drawn rake, used a leaf blower and raked by hand until the landscape was presentable once more. I trimmed bushes with a newly acquired, battery operated hedge trimmer – making it easier to reach bushes far from an electrical outlet. After we got cleaned up, Bonnie and I worked on our classes to be taught next month in Guyana, South America. That’s just a beginning, as we must put much more time into that before we will be ready. In addition, we continue to work on The Voice of Truth International so it can go to the printing company in early July. It is past time to work on the next issue of Gospel Gazette Online, and we need to work more on the upcoming issue of Global Harvest magazine. Sunday morning, we drove to the Siwell Road Church of Christ meetinghouse in Jackson, MS. There, we attended a Bible class taught by Dale Ledbetter, one of the elders. We worshipped with the congregation in the next hour, at which time it was announced that Bonnie and I are placing our membership with the congregation. The Siwell Road Church of Christ assumes our oversight and sponsorship for our mission work officially on July 1. Mark Polk, one of the brethren with whom we will be working closely and Bonnie and I lunched together at a Mexican restaurant not far away. Sunday evening, we plus Rebecca who had come to our house in the afternoon worshipped with the West President Church of Christ in Greenwood, MS. When in town, we often attend there, especially for Wednesday evening Bible classes. This congregation is very mission-minded, too. Days between travel and events are punctuated with working in the print shop at World Evangelism (e.g., binding books, printing envelopes and order forms, etc.) and daily duties to help keep the behind the scenes activities going that are so essential to the stateside travel and foreign mission work. Please remember us from time to time in your prayers. Thursday, June 16, a van load from the Liberty Church of Christ in Dennis, MS arrived around 9 a.m. in Winona. This is the congregation that sponsored J.C. and Betty Choate in world evangelism and that still sponsors sister Choate. The elders of the Liberty Church of Christ oversee television, radio and literature evangelism abroad pertaining to the Choates. Bonnie and I along with Jerry and Paula Bates as well as others voluntarily participate in aspects of that mission work. The boys and girls and men and women from the Liberty congregation came to work with all of us in Winona, MS for a day. A couple of the men built still one more shelf in the warehouse to accommodate more mission materials arriving soon. Everyone else from the Liberty Church of Christ participated with us in the preparation of four separate Post Office mailings. Items readied for mailing included 1,500 packages of Global Harvest magazine, 266 single copies of The Voice of Truth International magazine, 150 cases of The Voice of Truth International and 471 Rushmore Newsletters. It took the local Post Office two days to mail everything out, and we overtaxed its capacity! Winona workers included Betty Choate, Jerry and Paula Bates as well as Louis and Bonnie Rushmore. Bonnie took most of the pictures and Louis prepared mailing labels and worked on the Rushmore Newsletter. Comments: Comments Off on Shipping It Out! Friday, June 10, a tractor-trailer pulled up at 600 Devine Street in front of the World Evangelism Building as it has so many times before. On it were four pallets of The Voice of Truth International magazine and a book title. No lift gate on the truck and no truck dock, one box at a time Paula and Jerry Bates, Betty Choate, Clayton Malone (Betty’s brother-in-law), Bonnie and I unloaded the truck on a hot, sunny day. No out of town appointment over the weekend, Bonnie and I tended to yard work (actually, we stretched it over three days). Sunday, we worshipped morning and evening with the good brethren at the West President Church of Christ in Greenwood, MS. Monday, Bonnie and I had eye appointments in Grenada, MS, after which we headed to our daughter’s home in Collierville, TN. We passed through a severe thunderstorm with 70 mph winds, fierce rain and cloud to ground lightning; the wind and rain threatened to push us off Interstate 55. That night, we attended the first night of the Collierville congregation’s annual VBS. Still later in the evening, we finished writing and layout for our next Rushmore newsletter. Tuesday morning, we met with the Collierville Church of Christ’s two preachers to brainstorm some programs for the local church and talk over our upcoming mission trip to Guyana with several members of the congregation there. The reason for trip to the Memphis area this time was to pick up a couple of cases of envelopes for mailings, some of which will take place later this week. After gassing up in Southaven, MS, getting an oil change and car wash, we stopped to get a UPS for the Winona office to replace one that failed recently. Arriving back in Winona late in the afternoon, nevertheless we began printing our newsletter and printing the envelopes in preparation for that mailing. Still later, I made some phone calls respecting upcoming speaking appointments. There is always more to do than time in a day will permit, which provides variety and purpose in one’s life. Tuesday afternoon June 7, Bonnie and I departed from Rebecca’s home and made our way from Collierville, TN to Florence, AL. 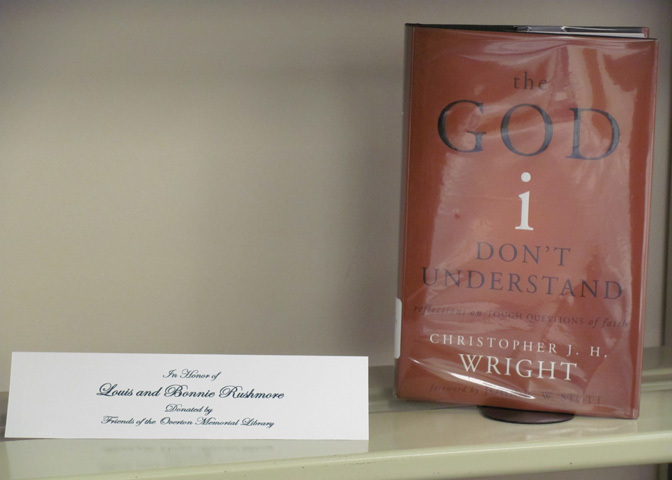 The Friends of the Overton Memorial Library invited the two of us to the Sixth Honors Evening, and a book was donated to the Overton Memorial Library in our honor as missionaries. A gathering of dozens of brethren especially honored some in particular who for years have served Heritage Christian University. 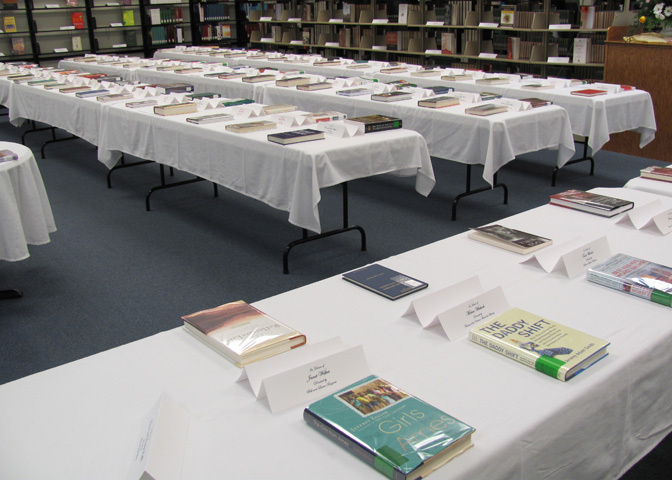 Among the numerous books being added to the research library of nearly 91,000 volumes was a facsimile of the Codex Sinaiticus. Among the guests present were Edmund and Maurine Cagle, longtime missionaries to Guyana, South America; Bonnie and I are joining Rebecca in July for a mission trip to Guyana in connection with the work of the Cagles. Following some light refreshments, Bonnie and I headed back to Winona, MS – over four hours away; wearily, we arrived about 1 a.m. Wednesday. Over the last four weeks, we spent about three days at the house in Winona amidst travels to Alabama, Georgia, Florida, Tennessee, Kentucky, Ohio, Pennsylvania and West Virginia. Sunday morning, June 5th, Bonnie and I, with Rebecca in tow, literally rode the ridges from Bethlehem, WV to Cameron, WV. Speed limits on US 250 of 55 mph have always amused me; it is impractical between the curve warnings signs to get up to 55 mph. I used to tease Bonnie by asking occasionally, “Where do you suppose that road over there” or “down there goes?” Early on, Bonnie would say, “I don’t know,” and I would say, “That’s the road we’re on!” It didn’t take long for my sweet wife to just ignore my dumb questions. As one old song lyrics belted out, “switchback city” and curves looking like “a can of malaria germs.” On the way out to Cameron, Rebecca sat in the front to stay her stomach, but she braved a middle seat upon our departure later. It is always a distinct pleasure to commune with dear brethren in Cameron who are more to us than part of our spiritual family. Brother Paul Marty with clarity of a preacher’s voice to be desired taught the Bible class and expertly with enthusiasm led the singing for worship. During worship, I made my PowerPoint Motivated by the Cross about our 2010 mission trips to India and Myanmar (Burma). Following worship, we all enjoyed a potluck, fellowship meal together. We almost forgot, but we snapped a few pictures before everyone got away. My little buddy Brayden isn’t so little anymore; he is maturing and a handsome young man. Jennifer and Sarah, sisters for sure, but one of them blinked (or is sleeping) for the picture, of course. Edith may be the matriarch now, lovelier as the days come and go; everyone seemed to not have changed at all unless it was in a complimentary way. For evening worship, we three Rushmore pilgrims traversed the comparatively few miles from Cameron to Marietta, OH and communed with the Harmar Hill Church of Christ; J.D. 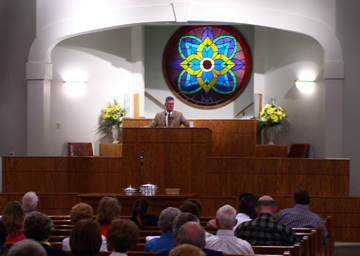 Conley preaches for this congregation. After worship, the Nulph family and we went to Pizza Hut for supper. Julene and Rodney are dearest of friends to us, and Rodney is one of the Editors of Gospel Gazette Online. We really joy in their three children; they were thrilled with the bamboo hats that we brought them from Burma. I forgot to use redeye reduction when I snapped their picture, so I had to touch up the photo, darkening their otherwise bright and vibrant eyes. Monday was a travel day all the way back to Collierville, TN. With a little relief driving from Bonnie and Rebecca to give me a break, we weren’t too worse for the wear for making the 12-hour jaunt across Ohio, West Virginia, Kentucky and Tennessee.